Indian ten dollar gold coin values have risen to $643 each. This is the minimum value of a coin that has been in circulation, shows wear and is a common date. However, there are many dates and mints that are not common, with values in the $1,000 plus range. And a few rarities, worth many thousands. The value chart lists all dates and mints. 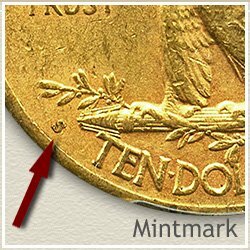 Finding a rare date or rare mintmark are two ways to higher values. Also, the condition of your coin plays a major role in its valuation. What is the condition of your coin? Worn with the finer details lacking or fresh looking with lustrous surfaces remaining. 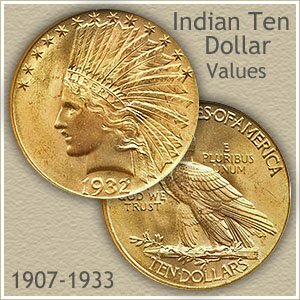 The 1932 Indian ten dollar gold coin pictured, is a "common" date, but in an uncommon state of preservation. This coin would be a prize addition to any collection, and worth over $718 . Grading gold coins is covered below. Very important to the accurate value of Indian ten dollar gold. To clarify, the word "common" refers to the relation between these coins within the series. One date may enter the market more often and seem common compared to the others. In reality, at over $643 each all are scarce and many dates rare. And the highest prices are found in the "Uncirculated" category. The above are wholesale Indian ten dollar gold coin values. Computed from dealers price lists with various markup factors figured in. They reflect closely the value you would expect to receive when selling. Before collectors or dealers place a value on any coin, they first judge its condition. The process is known as "Grading." As a coin circulates and wears the different stages are noted and assigned a grade. Indian ten dollar gold coin values depend on this evaluation. Since collectors and dealers are willing to pay a premium for better condition coins. A close and careful examination of your gold piece often leads to discovering a higher value. 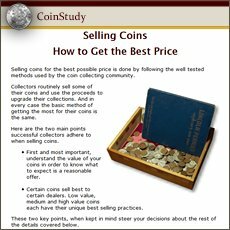 Compare your coins to the grading image and judge its condition. An "Uncirculated" gold coin is very lustrous with no wear. Examine her cheeks and hair for breaks in this luster. If slight wear is evident with breaks in the luster the coin drops to the "About Uncirculated" grade. Additional wear, noticeable in the hair over the ear and feathers in the headdress drops the coin to the "Extremely Fine" condition. If you feel your coin is in very nice condition and are just not sure of the grade, help available. Submit your coin to a grading service. Today most gold coins are sent to a grading service before a dealer offers them for sale. Many dealers display images of their inventory, check listings, look for those offering Indian ten dollar gold coins similar to yours. Their listings and prices normally include a notation of the NGC or PCGS assigned grade. Additionally, these coin dealers are potential buyers of your coins. In many years Indian ten dollar gold coins were minted in less quantities at the branch mints. Fewer minted, fewer to save, the result, higher Indian ten dollar gold coin values. Three mints produced Indian gold coins. The Denver mint, identified by a "D" and the San Francisco mint used an "S" mintmark. The third mint, in Philadelphia did not use a mintmark. Find the mintmark on the reverse, along the rim, just above the "TEN." 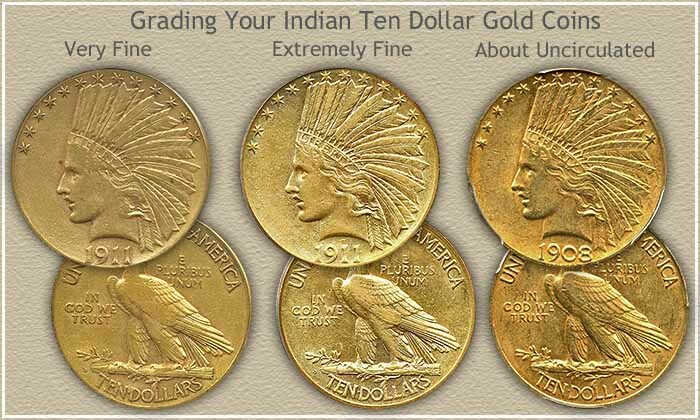 Your Indian ten dollar gold coin is one of the more popular coins series. With its impressive design, large size, large gold content, it is highly collectable. Indian ten dollar gold coin values are sure to trend higher. All old US coin values. The home page is an excellent index, quickly leading to the major coin series. From Cents to Gold. Having accurate values of your gold coins allow you to find the best buyers when selling. Print the Coin Values Worksheet - link in navigation column - to list your Indian ten dollar gold coins and record their values. Should you decide to sell... use the worksheet as an invoice and packing slip when sending coins through the mail to dealers. It indicates you have done your coin values homework, very important with today's high values.